I always said that it would take something terrible to happen to Roman Reigns for him to be appreciated, and I can’t tell you how much I hate the fact that I was right. But at the same time, I am so grateful that the audience showed a different side of themselves last night, listening respectfully and chanting Roman’s name, chanting “Thank you, Roman”. When he said he had to relinquish the Universal Title, there were even dismayed cries against him doing so, though it was obvious that there was no other choice. He was right: he couldn’t be the fighting champion that he’d promised; he needed time away to focus on his family and focus on his health, to fight leukemia into remission a second time. “By no means is this a retirement speech”, he said, and I believe that. What I also believe is just how beloved Roman is by his coworkers. Dean Ambrose, always private about his emotions, struggled valiantly to keep his composure on stage while Seth Rollins openly wept. 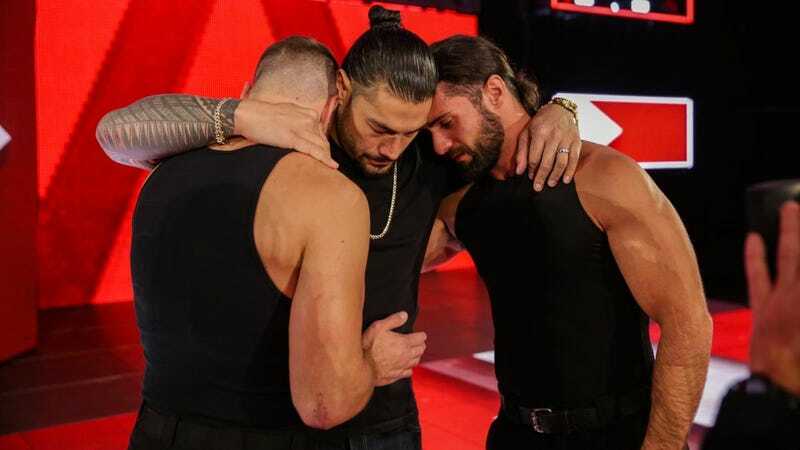 Backstage, Braun Strowman hugged him and told him that he loved him, that he was there for him, that he needed him to know that. As Jimmy Korderas says, “it really is a road family”. My heart goes out to Roman’s family, who lost his older brother Matt just last year. People often forget, Joe is a young father with three children: a ten year old daughter, and twin boys who are less than two years old. It’s a common saying in wrestling that everything’s a work, but this isn’t, not this time. It’s a real illness that was brought public in an effort to raise awareness. All kayfabe struggles have been set aside, as the Roman Empire goes to war. Roman is ready to fight, and for once the WWE Universe is united in wanting to see him win. What Happened During the Main Event of WrestleMania 34?